Earwigs are odd looking insects which have pincers or forceps protruding from the abdomen. Some may say that resemble an alien creature. They are somewhat intimidating looking but they are not poisonous, and they do not spread disease. Depending on the species, adults range in size from 5-25 mm. They are slender insects with two pair of wings. Most types of earwigs generally prefer wet areas which are cooler and undisturbed. Earwigs can be a serious garden pest if conditions are right. If there is adequate ground cover, wet soil, and food, the earwigs will do well. Earwigs typically feed on live sprouts or decaying vegetation and, in rare cases, some species are predators. Earwigs are relatively fast moving. They run away quickly when the ground litter is moved, uncovering them. 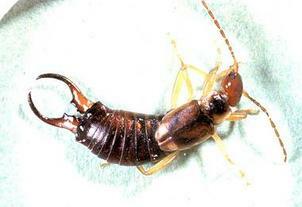 ​Earwigs are nocturnal and are active at night. During the day they hide in cracks in damp areas. They live under rocks and logs and in mulch in flowerbeds. Earwigs are attracted to lights. They can become a nuisance on porches and patios on summer evenings. In the morning they will be gathered under things like cushions that were left outside overnight. Earwigs move into homes to find food or because of a change in weather.They usually wind up indoors while seeking shelter or just happen to wander inside through open doors. Earwigs prefer cool, damp areas and may enter homes during extended dry periods. Homeowners often find them in areas where there is water – kitchens, bathrooms, and laundries. Earwigs can also find their way into bedrooms and family rooms. The most important part of controlling earwigs is eliminating their hiding places. If the earwig harborages are not addressed, insecticide application will probably not control earwigs very well. There are a variety of things that can be done. Clean Up – Move landscape timbers, logs, decorative stones, and firewood piles away from the foundation. Eliminate Moist Soil – Create a zone next to the foundation that is free of mulch, dead leaves, and other organic material. The “dry zone” should be 6” to 12” wide so that earwigs will avoid it. Trim Overhanging Branches – Trim trees and shrubs that cause damp, shady areas near the house. Proper Drainage is Key – Examine gutters and downspouts to make sure they drain away from the foundation. Set irrigation systems so that they water in the morning and allow the landscape to dry during the day. Switch Up Exterior Lighting – Adjust outdoor lights to shine from the yard onto the house – insects will be attracted away from the house. If moving outside light fixtures is not practical, consider changing light bulbs to yellow bulbs since white lights are more attractive to insects. Secure Possible Entry Points – Repair screens on crawl space vents and make sure the vents are not blocked.